This scented Necktie Father’s Day Card smells just like Dad does after a shave. 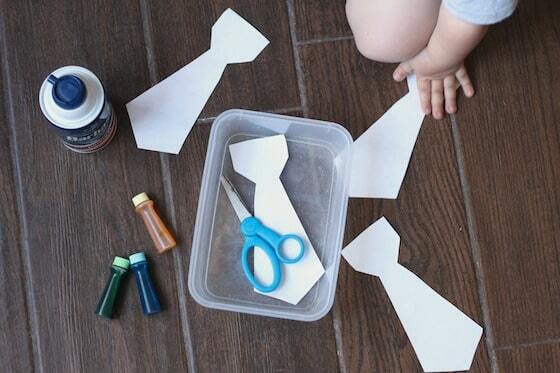 It combines a fun art technique and a couple of things that are synonymous with Dads – a necktie and shaving cream. 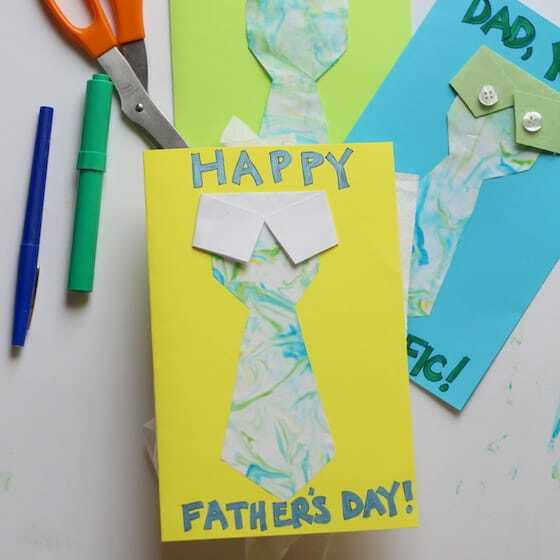 Kids will be proud to give this homemade card to Dad, Grandpa, an uncle or any “tie-riffic” male role model for Father’s Day. It’s a great card for kids to make for Dad’s birthday too! Father’s Day is June 17th this year. 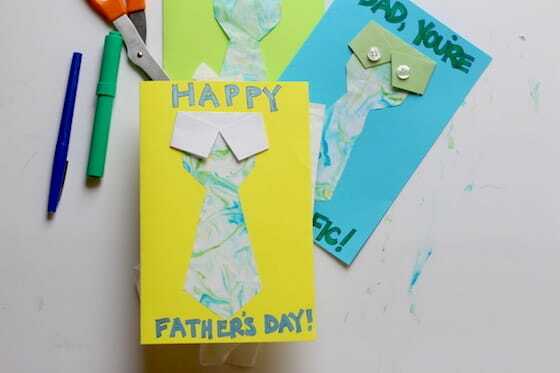 Instead of buying a card for your child to give to Dad, have them make a homemade card instead. Homemade cards, especially when made by young children, are so much more meaningful than any card you could buy at a store. And kids are so proud to give homemade, aren’t they? Their little faces light right up when we open up a card that they’ve put their hard work and effort into making. This year, we have a scented necktie Father’s Day card to share with you. Aren’t they adorable? 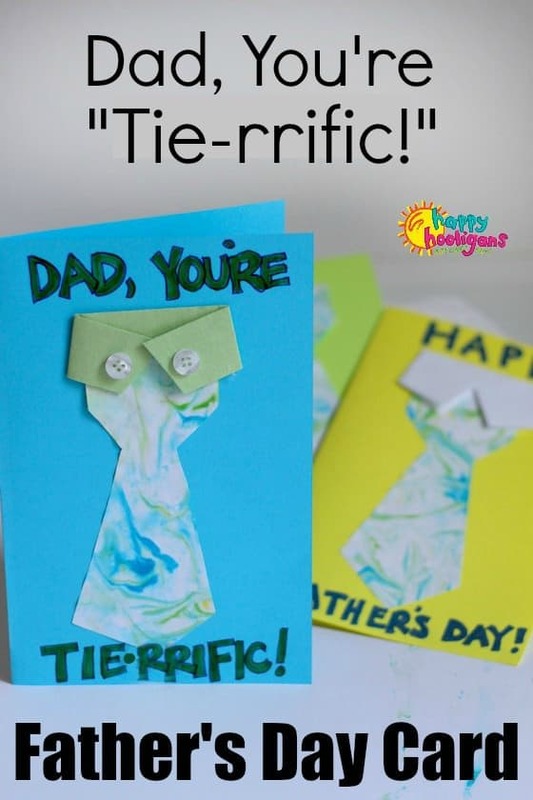 These necktie cards are a little different than the classic shirt and tie Father’s Day cards that you’ve likely seen when searching the net for Father’s Day card ideas. I came up with the idea the last time we made marbleized art with shaving cream and food colouring. When we finished that project, one of the hooligans commented that her marbleized paper smelled just like her Dad. I said we’d have to make Father’s Day cards this way some time because it would be pretty cool to give Dad a card that smells just like he does after he shaves. Today, we have Katie from Happily Ever Mom here to show you and your kids how to make these cards. If you’re not familiar with the process of making prints with shaving cream and food coloring yet, don’t worry. I’ll walk you through all the steps. My kids really loved the shaving cream and food colouring technique we used to make these cards. It’s easy to do, and will quickly become one of your kids’ favourite art techniques. 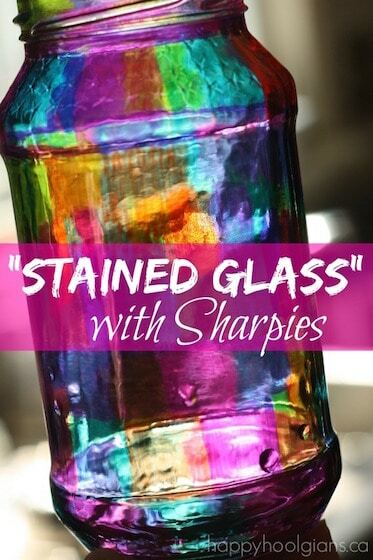 I love that it only takes two simple ingredients to create this marbled effect on paper. 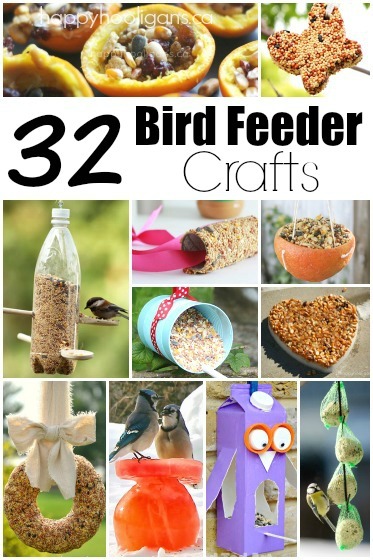 You could easily prep these cards in advance or you can do them last minute, so don’t worry if you need to gather some supplies first. 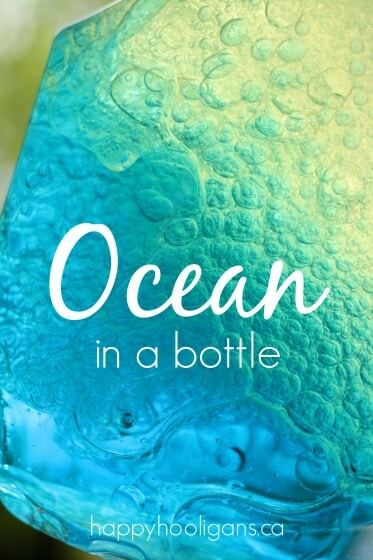 You’ll start by squirting the shaving cream into a small tray or on a flat surface. I used a small plastic container. Then, drip a few drops of food coloring on top of the shaving cream. You don’t need big drops here, but I did like to vary where we dropped the green, the blue, and the yellow dots. You’ll see why in the next step. 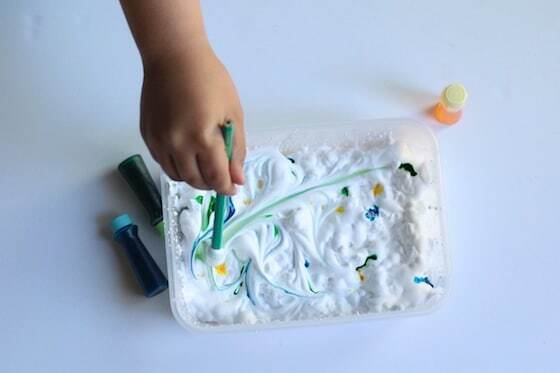 Next, grab a pencil or craft stick and swirl the shaving cream in a random design. The colors will swirl together which is why I like to have the different colors spread throughout the shaving cream. I challenged my kids to try to swirl the pencil through each dot of food coloring. 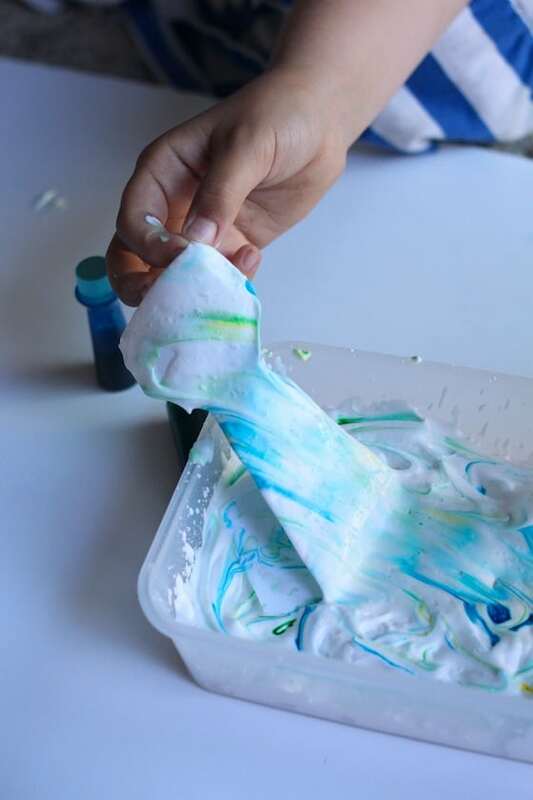 The key is to make sure that you don’t completely mix the food coloring into the shaving cream. Otherwise, you won’t get the marbled effect that we’re after! I pre-cut a few tie shapes out of white paper, but you could make your print on a full piece of paper and cut the tie out when it dries if you like. 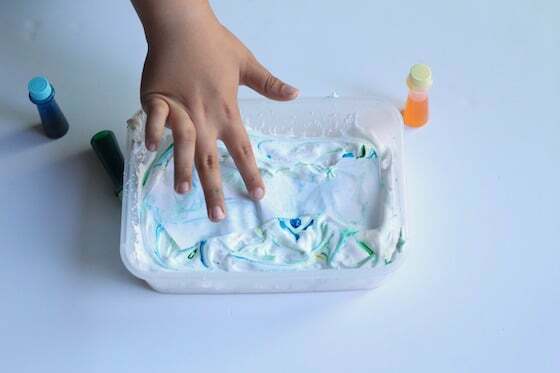 Press the paper on top of the shaving cream swirled with food coloring and give it a gentle push so that all of the paper is in contact with the shaving cream. Grab one end of the paper and lift it up out of the shaving cream. You’ll notice right away that there is still TONS of shaving cream all over the paper. We don’t want that. So, here’s what you do. 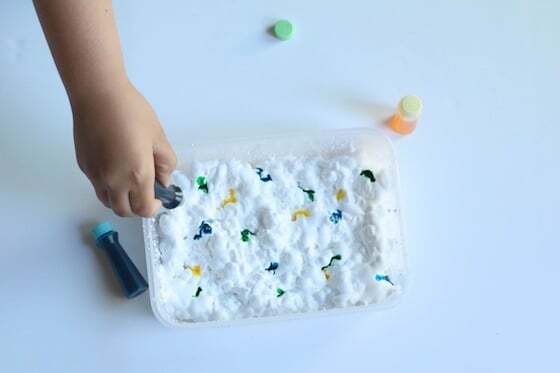 Take a small piece of cardboard or an old library card and scrape off the excess shaving cream. I like to scrape in one direction, but I don’t think it really matters. Now, you’ll start to see the marbled effect! Keep scraping until all of the shaving cream is off of the paper. You now have a beautiful tie for your Father’s Day card, and it will smell great! All that’s left to do is to assemble the card. My favorite part of this card is that it has a cute and simple collar to add a fun detail to the card. It’s not hard to make, but it really finishes the card. Cut a rectangle from the bottom of a piece of cardstock or paper. Fold this rectangle lengthwise. Fold the two ends of the collar towards one another, at a downward angle. This will be your collar. Paste the centre of the collar onto a folded piece of card stock. Paste the marbled tie on top of that, and then paste the two ends of the collar to the tie. Paste a couple of buttons on the collar. Have the kids sign the card, write inside, and decorate as much as they like!